vacancies in Gujarat GSECL Recruitment 2017. Candidates with full time diploma qualification are suggested to apply from 06-11-2017 through online using Gujarat State ECL official website www.gsecl.in. Application link will be closed on 11-December-2017. Selection of applicants will be based on online test held by GSECL. Pay Scale for the post GSECL Instrument Mechanic is Rs. 26000/- to Rs. 56600/-. Application fee for SEBC and UR candidates is Rs. 500/- and for SC/ ST candidates is Rs. 250/-. 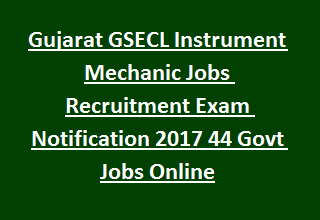 Follow the below given details of Important Dates, available vacancies, Pay Scale, age limits, educational qualification, application fee and application procedure for Gujarat State Electricity Corporation Limited GSECL Instrument Mechanic General Recruitment Exam 2017. There are total 44 vacancies are going to fill through this GSECL Recruitment Competitive Exam 2017. Total no of vacancies: 44 posts. For the post GSECL Instrument Mechanic salary offered is Rs. 26000/- to Rs. 56600/-. Candidates must have qualified full time Diploma in Instrument & control from any recognized University. Candidates with BE/ B.Tech degree qualification are not eligible for this post. Upper Age limit for UR candidates is 35 years and for SC/ST and SEBC candidates is 40 years. For female candidates 05 years age relaxation will be given and for Ex- Armed Force personnel candidates, PWD candidates is 10 years. The mode of payment should be through Challan or online mode. Candidates fulfilling the all eligibility criteria must need to attend written test/ Online test held by GSECL. Online Test Question paper will be in English and Gujarati Language. Question paper consists of 100 question and the total marks are 100 marks. Syllabus of Online Test and results will be displayed on the GSECL website. Only the candidates fulfilling requisite criteria are only requested to apply for this GSECL vacancies. Go through the online registration link www.gsecl.in available from 06-11-2017. Fill the required fields in the application form. Last date to send application is 11-12-2017 before 06-00 PM. Last date for making the application fee payment through challan is 17-12-2017.